American engineer mission specialist astronaut 1984-1995. Grew up in Honolulu, Hawaii. Died of cancer. Status: Deceased; Active 1984-1995. Born: 1944-09-18. Died: 1995-10-03. Spaceflights: 2 . Total time in space: 18.18 days. Birth Place: Chicago, Illinois. PERSONAL DATA: Born September 18, 1944, in Chicago, Illinois, but considered Honolulu, Hawaii, to be his hometown. Married to the former Alice Meigs Scott of Waycross, Georgia. Two children. He enjoyed surfing, bicycling, reading, and activities with his family. His parents, Mr. and Mrs. Marshall E. Veach, reside in Honolulu, Hawaii. Her mother, Mrs. Myrtle Lee Scott, resides in Augusta, Georgia. Her father, Commander Frank V. Scott, Jr., is deceased. EDUCATION: Graduated from Punahou School, Honolulu, Hawaii, in 1962; received a bachelor of science degree in engineering management from the U.S. Air Force Academy in 1966. SPECIAL HONORS: Distinguished Flying Cross with 2 Oak Leaf Clusters, Air Medal with 13 Oak Leaf Clusters, Air Force Commendation Medal with 1 Oak Leaf Cluster, and Purple Heart. EXPERIENCE: Veach was commissioned in the United States Air Force upon graduation from the Air Force Academy. He received his pilot wings at Moody Air Force Base, Georgia, in 1967, and then attended fighter gunnery school at Luke Air Force Base, Arizona. Over the next 14 years, he served as a USAF fighter pilot, flying the F-100 Super Sabre, the F-111, and the F-105 Thunderchief, on assignments in the United States, Europe, and the Far East, including a 275-mission combat tour in the Republic of Vietnam. In 1976 and 1977, he was a member of the USAF Air Demonstration Squadron, the Thunderbirds. Veach left active duty in 1981, but continued to fly fighters as an F-16 pilot with the Texas Air National Guard. He had logged over 5,000 flying hours. NASA EXPERIENCE: Veach came to work for NASA in January 1982 as an engineer and research pilot at the Johnson Space Center in Houston. His primary duty was as an instructor pilot in the Shuttle Training Aircraft, the highly modified Gulfstream II used to train astronaut pilots to land the Space Shuttle. Veach was selected as an astronaut candidate in May 1984, and became an astronaut in June 1985. He held a variety of technical assignments, and had flown as a mission specialist on two Space Shuttle missions, STS-39 in 1991 and STS-52 in 1992. He had logged 436.3 hours in space. Most recently, Lacy had worked as the lead astronaut for the development and operation of robotics for the International Space Station. On STS-39, Veach was responsible for operating a group of instruments which included an ultraviolet astronomical camera, an x-ray telescope, and a liquid helium-cooled infrared telescope which performed landmark observations of the Earth's atmosphere and the Aurora Australis (the Southern Lights). The 8-day unclassified Department of Defense mission aboard the Orbiter Discovery launched from the Kennedy Space Center in Florida on April 28, 1991, and landed at Kennedy on May 6, 1991. STS-52 was a 10-day mission aboard the Orbiter Columbia during which the crew successfully deployed the Laser Geodynamic Satellite (LAGEOS), a joint Italian-American project. They also operated the first U.S. Microgravity Payload (USMP) with French and American experiments. Veach was the primary Remote Manipulator System (RMS) operator on the mission, supporting the initial flight tests of the Canadian-built Space Vision System (SVS). STS-52 launched from the Kennedy Space Center in Florida on October 22, 1992, and landed at Kennedy on November 1, 1992. Lacy Veach died in Houston, Texas, on October 3, 1995, of cancer. Born September 18, 1944, in Chicago, Illinois, but considerd Honolulu, Hawaii, to be his hometown. Married to the former Alice Meigs Scott of Waycross, Georgia. Two children. He enjoyed surfing, bicycling, reading, and activities with his family. His parents, Mr. and Mrs. Marshall E. Veach, reside in Honolulu, Hawaii. Her mother, Mrs. Myrtle Lee Scott, resides in Augusta, Georgia. Her father, Commander Frank V. Scott, Jr., is deceased. Graduated from Punahou School, Honolulu, Hawaii, in 1962; received a bachelor of science degree in engineering management from the U.S. Air Force Academy in 1966. Distinguished Flying Cross with 2 Oak Leaf Clusters, Air Medal with 13 Oak Leaf Clusters, Air Force Commendation Medal with 1 Oak Leaf Cluster, and Purple Heart. Veach was commissioned in the United States Air Force upon graduation from the Air Force Academy. 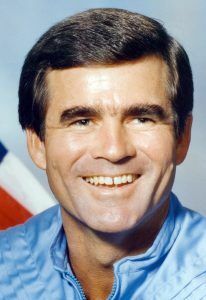 He received his pilot wings at Moody Air Force Base, Georgia, in 1967, and then attended fighter gunnery school at Luke Air Force Base, Arizona. Over the next 14 years, he served as a USAF fighter pilot, flying the F-100 Super Sabre, the F-111, and the F-105 Thunderchief, on assignments in the United States, Europe, and the Far East, including a 275-mission combat tour in the Republic of Vietnam. In 1976 and 1977, he was a member of the USAF Air Demonstration Squadron, the Thunderbirds. Veach left active duty in 1981, but continued to fly fighters as an F-16 pilot with the Texas Air National Guard. He had logged over 5,000 flying hours. Veach came to work for NASA in January 1982 as an engineer and research pilot at the Johnson Space Center in Houston. His primary duty was as an instructor pilot in the Shuttle Training Aircraft, the highly modified Gulfstream II used to train astronaut pilots to land the Space Shuttle. Family: Astronaut. Country: USA. Flights: STS-39, STS-52. Projects: STS. Agency: USAF. Bibliography: 12, 6148. 1944 September 18 - . Birth of Charles Lacy Veach - . Nation: USA. Related Persons: Veach. American engineer mission specialist astronaut 1984-1995. Grew up in Honolulu, Hawaii. Died of cancer. 2 spaceflights, 18.2 days in space. Flew to orbit on STS-39 (1991), STS-52..
1984 May 23 - . NASA Astronaut Training Group 10 selected. - . Nation: USA. Related Persons: Adamson, Baker, Brown, Mark, Cameron, Carter, Casper, Culbertson, Gutierrez, Hammond, Ivins, Lee, Low, McCulley, Shepherd, Thornton, Veach, Wetherbee. The group was selected to provide pilot, engineer, and scientist astronauts for space shuttle flights.. Qualifications: Pilots: Bachelor's degree in engineering, biological science, physical science or mathematics. Advanced degree desirable. At least 1,000 flight-hours of pilot-in-command time. Flight test experience desirable. Excellent health. Vision minimum 20/50 uncorrected, correctable to 20/20 vision; maximum sitting blood pressure 140/90. Height between 163 and 193 cm. Mission Specialists: Bachelor's degree in engineering, biological science, physical science or mathematics and minimum three years of related experience or an advanced degree. Vision minimum 20/150 uncorrected, correctable to 20/20. Maximum sitting blood pressure of 140/90. Height between 150 and 193 cm..
1991 April 28 - . 11:33 GMT - . Launch Site: Cape Canaveral. Launch Complex: Cape Canaveral LC39A. Launch Platform: MLP2. LV Family: Shuttle. Launch Vehicle: Space Shuttle. STS-39 - . Call Sign: Discovery. Crew: Bluford, Coats, Hammond, Harbaugh, Hieb, McMonagle, Veach. Payload: Discovery F12. Mass: 9,712 kg (21,411 lb). Nation: USA. Related Persons: Bluford, Coats, Hammond, Harbaugh, Hieb, McMonagle, Veach. Agency: NASA Houston. Program: STS. Class: Manned. Type: Manned spaceplane. Flight: STS-39. Spacecraft Bus: Shuttle. Spacecraft: Discovery. Duration: 8.31 days. Decay Date: 1991-05-06 . USAF Sat Cat: 21242 . COSPAR: 1991-031A. Apogee: 263 km (163 mi). Perigee: 248 km (154 mi). Inclination: 57.00 deg. Period: 89.60 min. Manned seven crew. Deployed USA 70, CRO A, CRO B, CRO C; deployed and retrieved IBSS. Payloads: Infrared Background Signature Survey (lBSS), Air Force Program (AFP)-675, Space Test Payload (STP)-I, Multi-Purpose Experiment Canister (MPEC), Cloud Logic to Optimize Use of Defense Systems (CLOUDS)-1A, Radiation Monitoring Equipment (RME)-lll. 1991 May 6 - . Landing of STS-39 - . Return Crew: Bluford, Coats, Hammond, Harbaugh, Hieb, McMonagle, Veach. Nation: USA. Related Persons: Bluford, Coats, Hammond, Harbaugh, Hieb, McMonagle, Veach. Program: STS. Flight: STS-39. STS-39 landed at 18:53 GMT. .
1992 October 22 - . 17:09 GMT - . Launch Site: Cape Canaveral. Launch Complex: Cape Canaveral LC39B. Launch Platform: MLP3. LV Family: Shuttle. Launch Vehicle: Space Shuttle. STS-52 - . Call Sign: Columbia. Crew: Baker, Mike, Jernigan, MacLean, Shepherd, Veach, Wetherbee. Payload: Columbia F13 / Lageos 2 [Iris] / CTA. Mass: 9,106 kg (20,075 lb). Nation: USA. Related Persons: Baker, Mike, Jernigan, MacLean, Shepherd, Veach, Wetherbee. Agency: NASA Houston. Program: STS. Class: Manned. Type: Manned spaceplane. Flight: STS-52. Spacecraft Bus: Shuttle. Spacecraft: Columbia. Duration: 9.87 days. Decay Date: 1992-11-01 . USAF Sat Cat: 22194 . COSPAR: 1992-070A. Apogee: 307 km (190 mi). Perigee: 304 km (188 mi). Inclination: 28.50 deg. Period: 90.60 min. Deployed Lageos 2, CTA. Payloads: Laser Geodynamic Satellite (LAGEOS) II/ Italian Research Interim Stage (IRIS), Canadian Experiments (CANEX) 2, United States Micro-gravity Payload (USMP) 1, Attitude Sensor Pack-age (ASP), Tank Pressure Control Experiment (TPCE), Physiological Systems Experiment (PSE), Heat Pipe Performance (HPP) experiment, Commercial Protein Crystal Growth (CPCG), Shuttle Plume Impingement Experiment (SPIE), Commercial Materials ITA Experiment (CMIX), Crystals by Vapor Transport Experiment (CVTE). 1992 November 1 - . Landing of STS-52 - . Return Crew: Baker, Mike, Jernigan, MacLean, Shepherd, Veach, Wetherbee. Nation: USA. Related Persons: Baker, Mike, Jernigan, MacLean, Shepherd, Veach, Wetherbee. Program: STS. Flight: STS-52. STS-52 landed at 14:13 GMT. .
1995 October 3 - . Astronaut Charles Lacy Veach dies at age of 51 -- Natural causes - Cancer. - . Nation: USA. Related Persons: Veach. American engineer mission specialist astronaut 1984-1995. Grew up in Honolulu, Hawaii. Died of cancer. 2 spaceflights, 18.2 days in space. Flew to orbit on STS-39 (1991), STS-52..